Bhutan, officially the Kingdom of Bhutan is a landlocked state in South Asia located at the eastern end of the Himalayas. It is bordered to the north by China and to the south, east and west by the Republic of India. Further west, it is separated from Nepal by the Indian state of Sikkim, while farther south it is separated from Bangladesh by the Indian states of Assam and West Bengal. Bhutan's capital and largest city of the Kingdom is Thimphu. Nestled at the foot of the Himalayas, Bhutan seems to ignore the years. After centuries voluntary isolation, it partially opened its doors in 1974, leaving the first amazed by the landscapes of extraordinary beauty travelers, the architecture of its buildings, the great hospitality of its people and its perfectly intact traditional culture. Despite abundant natural resources, Bhutan was then emerged as one of the poorest countries in Asia, refusing to engage in the pursuit of profit at any cost. Deeply rooted in the past, now young ruler began to modernize his way. He intends to preserve its culture and natural heritage and fiercely defends its Buddhist values. The size of Switzerland, Bhutan is wedged between Tibet to the north and northwest, and India. It is a country of mountains, which rises to 7,554 m KulhaGangri to the Tibetan border. It consists of three main geographical regions: the Himalayas in the north, the hills and valleys in the center and south plains. Impetuous rivers dug its relief and ensure its hydropower. Isolation of several centuries, its small population and its relief allowed Bhutan to retain its traditional ecosystem. It is home to many flora and fauna that thrive in very diverse habitats. According to the law, 60% of the kingdom must remain wooded. He is still 72%. These forests contain more than 5,500 species of plants, including some 300 medicinal herbs. There are 165 mammal species, sometimes endangered, such as the golden langur, snow leopard and the lesser panda. It was also listed so far 770 different species of birds, including the rare black-necked crane. Protected areas, which account for about a quarter of the country, cover uninhabited. The gradual establishment of a program of conservation and development can balance the needs of the population and the desire to protect the environment, constant concern of the government. National parks cover very important ecosystems and have in any case been converted into tourist attractions. It also penetrates often unknowingly. Bhotia people, the majority, of Tibetan origin, regrouped in basins, south of the Great Himalayas, around Buddhist monasteries (dzong), which are also major landowners. The Ngalongs (or Ngalops) Tibetan and attached to the Himalayan population Bhotias origin, are concentrated in the east and center of the country, while Sharchops East (very heterogeneous group) were largely assimilated by the dominant culture of the first or marginalized. In these two main groups, add various minority groups (Monpas, Khengs, Layaps, Lepchas ...) and the population of Nepalese origin. Dzongkha ("the language of the fortress," Tibetan dialect) is the official language of Bhutan. Language of administration and now taught in schools, it is nevertheless practiced by 20% of the population. Lowlanders Bhutan speak dialects of Tibeto-Burman origin. Although uncommon, English is the language most commonly used. 75% of the population is Buddhist. Bhutan is the only country in the world to have built Mahayana Buddhism in its Tantric form, as an official religion. Southern populations of Bhutan, of Nepalese origin, are predominantly Hindu. September: Festival Thimphu Tsechu, the largest religious festival of the region. December: Day "NineEvils' Day." During this festival, people stay at home, convinced that doing evil deeds multiply the impact of bad karma actions on that day a consequence. Any artistic creation, whether it be dance, theater or music, is closely linked to Buddhism. You do not create a work to please tourists, but for religious reasons. The parties actually reflect the national faith and most artistic events illustrate the struggle between good and evil. These traditions are fully expressed in the tsechus, spectacular religious festivals. In Bhutan, it is customary to dress decently, especially when attending religious festivals that require discretion. As possible to refrain from smoking and avoid talking too loud. It is usually customary to leave an offering after visiting a temple or monastery. As a courtesy, always ask permission before taking a picture of a person, usually she will not refuse. If you are invited to share a meal with family, know that it is customary to withdraw from the last finished dish. It is not impossible that your guests retire during the meal or they simply watch you eat. Note that recently, the dress code is seriously hard for visitors to the Paro Dzong. Are no longer allowed: shorts, t-shirt, sandals, skirts (long or short). It is therefore preferable for men as for women to go there dressed in trousers, socks and shoes with a high "correct" as a sweater or shirt. Any artistic creation, Whether it be dance, theater or music, is Closely linked to Buddhism. You do not create a work to please tourists, religious Reasons for purpose. The parts Actually Reflect the national faith and MOST artistic events Illustrate the struggle Between good and evil. These traditions are fully Expressed in the tsechus, spectacular religious festivals. In Bhutan, it is Customary to dress decently, Especially When at attending religious festivals That discretion require. As can tune to from smoking and Avoid talking too loud. Usually it is to leave Customary An Offering Effective visiting a temple or monastery. As a courtesy, always ask permission before taking a picture of a person Benthic, usually She Will not refuse. If you are invited to share a meal with family, know that it is customary to withdraw from last finished dish. It is not possible That removes your guests falling on the meal or simply watch you eat They. Note That Recently, the dress code is Seriously hard for visitors to the Paro Dzong. No follow are allowed: shorts, t-shirt, sandals, skirts (long or short). It is therefore preferable for men as for women to go there dressed in trousers, socks and shoes with a high "right" as a sweater or shirt. A visa is required to enter Bhutan. It must be requested at least 15 days before departure, through us. It will be issued once on site, against $ 20US and two passport photos. The visa issued will be valid for 15 days. An extension of the visa can be obtained in the capital Thimphu, for a payment of 560 Ngultrum. Information relating only to the holders of French passport. any other nationality, check with your embassy. Since opening its doors to tourism in 1974, Bhutan strives to preserve its traditions. To do this, the entry into the country conditions are draconian, but not insurmountable. There is just a few rules. It is imperative to go through a travel agent, who will relay the request for a visa at the governmental body, the TourismAuthority of Bhutan responsible for issuing the precious. But you must have previously selected your circuit. And it is only from there that the agency will arrange your flights with the airline Druk Air, the only one to operate flights to Bhutan. 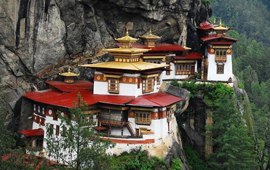 Bhutan requires, on the part of tourists, a minimum amount of daily expenses. Thus, the stay costs per day and per person at least U.S. $ 200 in low season (January, February, June, July, August, December) and $ 250 in high season (March, April, May, September , October, November). These expenses include accommodation, meals, guide, driver, local taxes and tourist fee. In winter, +5 h00 compared to Paris, and in summer, 4 h00. The official time is 30min ahead of Indian time. The national currency of Bhutan is the Ngultrum (BTN) at par with Indian and divided into 100 chhertum Rupee. The currency is in denominations of 1, 5, 10, 20, 50, 100, 500 and 1000. It is also possible to make payments in Indian rupee in Bhutan. Travelers checks, dollars and euros can be changed in some hotels and Bank of Bhutan in Thimphu. Have a maximum of small bills to pay for purchases. It is not easy to pay by credit card in Bhutan. In addition, the country does not have a developed system of ATMs, to withdraw money by credit card. It is therefore advisable to bring enough cash to make purchases. Warning, the Bhutanese Ngultrum was not over in India, so you will pass your local currency before leaving Bhutan. No vaccinations are required for Bhutan, but it is recommended to be up to date diphtheria-tetanus-polio. Other recommended vaccinations: typhoid and hepatitis A & B and. Antimalarial prophylaxis is recommended in some areas. Consult your doctor or international vaccination center of the Pasteur Institute (tel: 0890.710.811). Country information on the website of the Institut Pasteur: http://www.pasteur.fr/fr/map. The above information is given for guidance. They are subject to change by your departure, ask to prepare your trip. Carry your personal medical treatment and what fight against stomach and intestinal disorders. Provide protection against the sun often biting. It is highly advisable not to drink tap water, eat vegetables or fruit that you have not you removed the skin. Beware of air conditioning for hotels and always have a scarf to protect your throat temperature differences with the outside. The voltage in Bhutan is 220 volts. Outlets are in principle European style hotels but for some, it is advisable to bring an international adapter strip. Provide a flashlight in case of power outages quite common. Bhutan has neither domestic air routes, or trains. It will therefore stick to motor vehicles or walking. Everything being arranged prior to your departure, you should not have to worry about transportation. Road conditions vary depending on the season. During the monsoon, it is possible that some areas are cut. The main road network allows to visit the country from west to east, passing by the most important sites. It consists mainly of very winding mountain roads. Tipping is not part of the customs of the country. The country offers a beautiful craft: bamboo objects, wood, silver, lots of fabrics, textiles, religious paintings (thangkas), jewelery, silverware, engraved slate, basketry. It is relatively expensive and not as authentic oriented tourism market. You will find mainly in shops Paro and Thimphu. Do not hesitate to buy when you find something you like because stocks are low. Advice to smokers, Bhutan is one of the few countries in the world to have banned the sale of cigarettes. It is always possible to smoke in public places except of course, and in some districts of the East, but you must bring with you your cigarettes with the risk of being taxed at customs. A decent outfit for any occasion, comfortable clothing for the day but think jacket and sweaters for the mornings and evenings. A windbreaker is not useless. Do not forget the sunglasses special mountain, cap or hat and sunscreen high index. The ideal times to visit Bhutan are spring and fall. From March to June, daytime temperatures are very pleasant (about 27 °) and at night (between 15 and 20 °), which is rare in the mountainous regions of the Himalayas. Only bad point, at this time, the peaks are often covered by thick fog. Autumn (October-November), the temperatures are cool (around 0 ° night), but the sky is bright blue. Summer, Bhutan knows the monsoon season from late May to September. Rainfall is generally quite low, and it is still possible to visit the country during this period, with the exception of the months from June to August, during which water spouts can befall Thimphu and the hills of the EST. In winter, from late November to mid-March, it is cold, but the Central Valley, the most touristic area around Trimphu, has a dry winter without much snowfall.